With each of our regular releases to iCarol we include enhancements, new tools, or new features. Our next release, tentatively scheduled to occur later today, includes many items, a few of which we’d like to highlight for you. The Chatboard is an included feature with any iCarol system and it’s a great way to improve communication at your helpline. 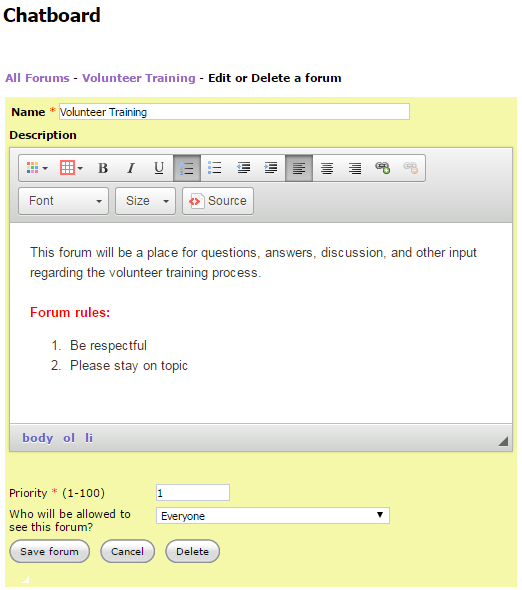 Managers and staff can create and moderate forums for discussion, and volunteers and other members can add their thoughts and take part in the conversation. Decide upcoming training dates, debate hot topics, coordinate on-call coverage, and more. 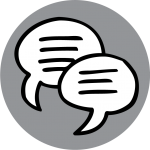 The chatboard promotes an ongoing, living dialogue as opposed to circulating printed memos that offer only one-sided information sharing. It also reduces email clutter, taking the place of mass emails and numerous reply all responses landing in your inbox. And all of this communication is enjoyed within the security and protections of iCarol, so sensitive or confidential conversations are limited to only those with access to your system. Email did have a leg up on the Chatboard in that emails could be searched and filtered in a way our Chatboard didn’t support — until now. With this week’s release you can opt to turn on search functions within your Chatboard that will enable users to search and find posts more quickly — perfect for those of you who use your Chatboard regularly and may have logged dozens or hundreds or posts over time. Admins can decide whether or not they wish to allow this search function. To turn it on you’ll simply navigate to Admin Tools on your left menu, click the Tools tab, and then take a look under the ‘Communication Features’ heading. There you turn on the Chatboard search function by checking the ‘Enable Chatboard Search’ box. Don’t forget to click the ‘Save all settings’ button found at the top of the page. And with that, the feature is turned on. 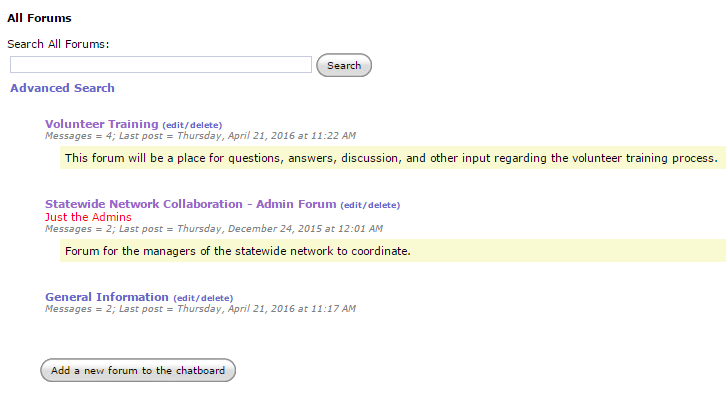 When you next navigate to your Chatboard you’ll see a search bar above your list of forums. Clicking ‘Advanced search’ will pop open more options. 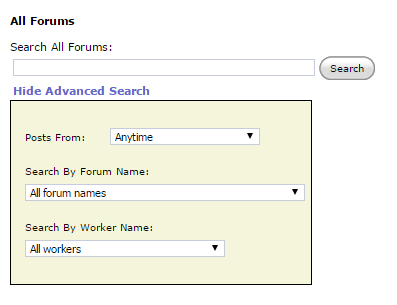 Here you can select a time frame to search within, filter by certain forum or by a particular user. Users with an Admin security level, or others granted special permissions, can export data from their iCarol system. 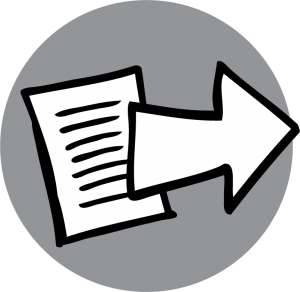 This includes, among other things, Shift information, Volunteer and Staff user profiles, Call Report Form data, and Resource data. The export files are in .csv format and can be imported into a number of programs for viewing or analysis, Microsoft Access or Excel, for example. Columns of data can easily be sorted or filtered using the tools of these programs, and users with a more advanced grasp of these programs can further manipulate data via pivot tables or write queries to analyze the data that’s been logged. Depending upon the amount of data being exported, some extracts are available on demand, while others have to compile in the background and the user will be notified when they’re ready for download. We’re very mindful of the importance of these exports, and balance that knowledge with the need to reduce the performance impact on our web servers and provide a top notch user experience for everyone. Our latest move to do just that is to adjust the queuing process for Resource exports. With this release, databases with 1,000 or more resource records will now be queued and processed systematically rather than being available for immediate download. For a full list of the enhancements coming with our next release, or to review items included in past releases, check out the ‘Release history and plans’ section of your Admin Dashboard. When reading the information keep in mind that descriptions can sometimes be technical in nature, and some items may not be applicable to your particular iCarol system. If you have questions or concerns, please contact our Support Team. We recently upgraded the iCarol Chatboard area so that it allows for Rich Text formatting on your entries. Previously the Chatboard offered Plain Text formatting only, which meant that all the text was going to be of a default font, default size, and no special formatting like italicized, bold, or colorized text could be supported. As the name implies, it was kept very plain. Rich text exposes more controls and gives you the option to do more with your entry. These new tools support more customization and creativity in your forum’s format as well as making the entries more visually pleasing. You can also add more organization and clarity to your forums. We hope you’ll enjoy using these new functions and that it will enhance the communication between you, your volunteers, staff, board members, and others who use your Chatboard to stay connected!